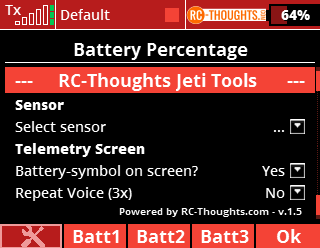 For downloads and how-to’s go to RC-Thoughts Jeti Tools here. I love this app! I refer to the battery symbol many times on every flight. I started noticing an issue with the Battery Symbol after a little over a year of very successful use. 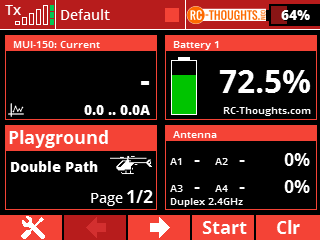 I use a Jeti 75A MUI ex sensor to feed a Jeti R9 US Receiver. I had a pretty server crash with this plane several months ago. After model repair all electricals systems seemed to be working great. However for the second flight the battery % symbol, in the display of my DC-24, showed only half full, even though my battery was fully charged. After takeoff the Battery % symbol reverted to the proper battery % and all worked correctly for the remainder of the flight. This pattern, (half green before takeoff and correct green after that off repeated for the third flight. Now the battery symbol shows 0% (no green) all the time and will not work at all. My MUI is sending the Voltage, Current and Capacity and the sent values seem to be correct and are logged for each flight. 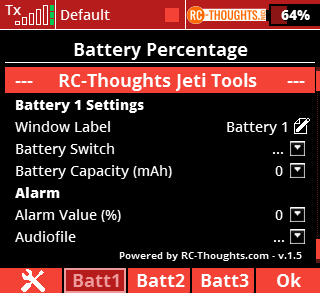 I can display capacity, voltage and current on the Jeti DC-24 display and look at the logged values, but the Battery symbol shows 0% (no green) on the display. I have updated the app to the newest version for the DC-24, version 2.4, but still have the issue. Can you tell me why this would be happening? . I don’t see how it could be the MUI 75 since every other display (current, voltage and capacity) is working correctly. Is there something in the Lua code I don’t understand? I thought Battery Percent was Battery Capacity minus consumed Capacity. If no settings are different in the app my best guess is that there is indeed issues with MUI or MUI's connection to receiver. If this would happen the MUI could be "seen now but not now, seen now again" etc. This would mean lua-app cannot read the sensor or value the whole time and could cause behavior like this. There is a check in the app "If sensor and sensor-value is valid then… else reset to no sensor". You crashing the plane (sorry, been there) would support this a bit. Have you checked the log-files? Perhaps comparing one from before crash? I'm having hard time understanding the app miss-behaving, it's most likely my most used app. Of course everything is possible. If you want I can have a look on a log-file for you, you can send it through contact-page.